One of the great things about genealogy is that sometimes the smallest of discoveries can make your day. As I've been tidying up my database, I've been looking again at many of the first birth, death and marriage certificates that I obtained. I'm spotting details that escaped my notice at the time, but which are are now tying up loose ends, or giving me new leads to follow. Every one of them, although minor, is exciting to me in it's own way. Here's an example of what I mean. In addition to their two living children, Robert Couper (1825-1898) and Isabella Miller (c1826-1908) had two deceased sons and one deceased daughter by 1856. Why did I not enter that into my database? As it happens I had already identified two of these young children, born in Scotland, who I supposed must have died before the family came to Australia as they weren't on the ship and don't show up in Australian records. This little piece of information confirms my theory. It also adds a place in my database for the other son who I haven't (yet?) been able to find in records. I don't know if he was born in Scotland or in Australia. While sad to see the level of infant mortality, it is somehow comforting to think that in a small way this nameless child is not forgotten. Can you make out the first name of the top witness? I sought help on Twitter. I think I must have picked the wrong time of day, or possibly of year, as I had only one reply (thanks Bobby) but no answer. I thought I knew what some of the letters were, and what others could be, but I couldn't make out a name. Success came when I started running wildcard searches over the Australian birth, death and marriage indexes on www.Ancestry.com.au. I didn't get it first try, but finally an exact search for Min* Lewis gave me the name. Minchin Lewis. Not a name I had heard of before, but all the lumps and bumps in the signature fit. He doesn't seem to be a brother for Frances as I had hoped, I will have to go back further to find out if he was related. The thing that struck me is that both Minchin and Frances named their first born sons James Abbott. Coincidence? Still more work to do, but this little achievement made my day! I don't know if I should admit this. After 20+ years of genealogy research (on and off) I recently placed my first ever order for a film from the LDS Family History Library! In the past there have been a number of things that stopped me from taking that step. When I first started out, I had no idea of the FHL's existence. Then having discovered it, I felt a level of discomfort at the idea of using the result of someone else's religious beliefs and practices, which I don't share, in pursuit of a hobby. This is no reflection of the Family History Center in Canberra (or anywhere else for that matter) as I had heard only good things about them. Having gotten over that feeling of timidity and even making a visit to the local Family History Center quite some years ago to check things out, I still never felt the need to order any film. I had plenty of material to be getting on with by post(! ), at the National Library of Australia, and later on the internet. My loosely defined research goal is to follow the life of Elizabeth Tregonning (1858-1952). In looking for relevant sources I have found some that are most readily available to me via the Family History Library. I have only very recently discovered that I can have the films sent to my local genealogy society, which is ten minutes closer to home than the local Family History Center. It may not sound like much, but when negotiating with my husband about minding our two under-fives while I'm swanning about genealogising, an extra 10 minutes of travel time each way makes a big difference. Finally, the big one, I can order the films online. I think this is only possible in a few countries, so I feel very fortunate. It makes a huge difference because it saves me from making an extra trip in order to order the film in the first place (see point 2 above). I put in my first order in about two weeks ago. The film I wanted had to be placed on backorder, but the delay wasn't long and I've now had notification that it has shipped. I'm really looking forward to actually viewing my first ever FHL microfilm sometime in the New Year. I'm sure this film order will be the first of many. I love it when a routine genealogy search suddenly takes me into new territory. A little under two weeks ago, Shauna Hicks tweeted about the launch of Northern Irish wills online. The information was free, and the will copy books were digitised. Although I have done little with the Irish portions of my family tree, I had to have a look. I tried my Irish family names in the surname field, with some success. I then turned my attention to the other search options. I typed the surname "Stannus" into the "Full Abstract" field and was rewarded with twenty records. Most were cases of people who lived in "Stannus place", but a few had a Stannus family member appointed as executor. As I scanned the surnames, and hovered over the descriptions for more detail, one entry on the front page jumped out at me. The name was Margaretta Mercer Mack, and she had appointed Catharine Stannus of Belfast, widow, as her executrix. Catharine Stannus, nee Mack, was my GGG grandmother and I know little about her. An index entry for Irish marriages on the FamilySearch beta site gives her father's name as Robert (having a look at that film is on my ever growing to-do list) but that's the limit of my knowledge. Genealogy happy dance! Margaretta was Catharine's unmarried sister, previously unknown to me! Not only that, the will named several other siblings as beneficiaries. Well, sort of beneficiaries, but I think I will save that for another post. Now I am left with more leads to follow up, pages and pages of wills to transcribe, and a useful tip to share: Don't limit yourself to entering surnames only in the surname field. You never know what new territory you may get to explore. A glimpse of a yellow shirt, passing by the window. A package on the doorstep. Me, jumping around in excitement saying "It's mine! It's mine!" while my husband reads the description of goods, with some suspicion, "SYNTHETIC PLASTIC TUBE AND INERT BUFFER." The DNA kit from 23andMe has arrived! I'm impressed with how quickly it got here. It shipped from the USA on Friday (my time) and landed on my doorstep first thing Monday morning. Great job, DHL Express! Inside the package I found a return envelope, detailed instructions, and a nice green package containing the testing kit. I notice that the "Collect by" date marked on the box is June 2011, so I don't really have a year to use the kit as suggested by the marketing of the $99 special. Never mind, I was planning on using the kit well before then. Next step: Psych myself up to start spitting! Each year my family would send and receive a modest number of Christmas cards. The cards that we received would be displayed on whatever surface was available, usually starting with the top of the television. Now there's something I will have to explain to my children! Yes, once upon a time, back in the olden days, televisions were housed in wooden boxes that could be used as a surface for decorative items. Along with the Christmas cards we would receive a few photocopied family newsletters packed with information about their activities for the year. We would hear about academic or sporting successes, career successes or failures, medical procedures, new relationships and breakups. We would wonder how widely they were distributing this sometimes very personal information! There's something else I should add to my list of things to ask Dad about - do we have a stash of those old Christmas newsletters our relatives used to send? Genealogically, they're a treasure trove. 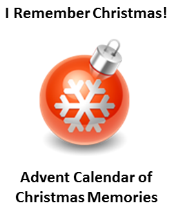 This post is part of the Advent Calendar of Christmas Memories, hosted by Geneabloggers. There is so little I can think of to say about our Christmas ornaments, I thought I'd skip the Advent Calendar for today and instead keep up the blogging momentum with a quick update on my genealogy activities. I've had some really good correspondence with other researchers on various branches of my tree lately. As a result I have quite a bit of new data to add. The DNA kit from 23andMe has shipped. Now I have to wait for it to make it's way across the sea. I wonder how long it will take? I am seriously considering changing genealogy software, which is not a move I take lightly. I love my current software, but unfortunately, I have noticed a glitch that I can't live with. It's not likely to be corrected any time soon as the developer is concentrating on the next version. I know I will have to do a big clean-up and lots of checking in the new software, which will probably be TMG. It's frustrating when I have so much momentum up in my research right now, but it has to be done. In last year's advent calendar, I wrote about eating a traditional (cold climate) Christmas lunch in the midst of an Australian summer. That completely inappropriate hot roast lunch is still a big part of what Christmas is about for me, but there is one other food that was a regular feature whenever we had a large gathering of family - Christmas and other occasions. It was my Mum's pavlova. Any Australian or New Zealander would be very familiar with the pavlova. It's a dessert with a meringue base, topped with cream and garnished with fruit. My Mum made her pavlovas from scratch, not from a premix "Egg". Usually she would make two. One, I thought of as the adults' pavlova. The fruit topping made it almost a health food, so far as I was concerned. The other was the kids' pavlova. Instead of fruit, my mother topped the kids pav with a smashed up Peppermint crisp. I have my mother's recipe, but I've never made it. I really should try to some day. I think I'd like to inherit her reputation as the pavlova queen! The Christmas tree that dominates my childhood memories was tall and bushy. Although it was an artificial metallic one, it was beautiful. The silvery tinsel branches shimmered and the baubles stood out like jewels. I didn't understand it when one year my mother said that the tree's time had come, we needed something new. Before I sat down to write this post, I dug out a few pictures of that lovely tree. Sadly, the photographic evidence does not do my memory justice. The tree is smaller than I recall. Not tiny, but small enough that it is almost obscured in the photos by a child standing in front of it. The silvery tinsel is duller than my memory would have it. The branches.. well, they look like they could put a running child's eye out. The baubles, although there, are not quite as plentiful as I imagined. It's the joy, shining from our faces. The photographic evidence confirms it - that tree was beautiful!